A two-car crash sent a mangled Porsche onto the train tracks in Encinitas, delaying train service for nearly two hours early Tuesday. 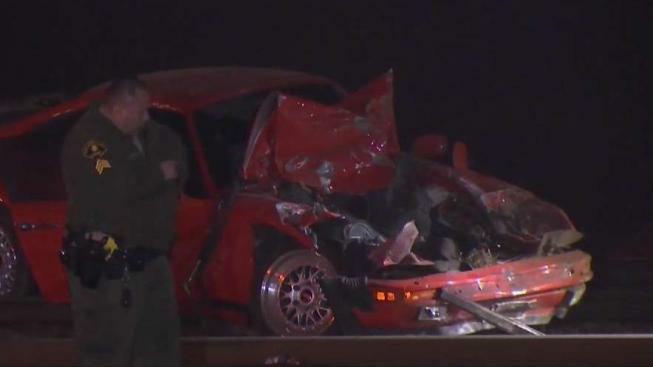 A gray truck and the red sports car crashed into each other on San Elijo Avenue near Coast Highway 101 at about 4:30 a.m., the San Diego County Sheriff's Department said. The impact from the crash sent the red sports car onto the train tracks, SDSO said. The occupants of both vehicles were minorly injured and were taken to nearby hospitals for treatment, SDSO said. It was unclear exactly how many people were involved. Because the car was stunted on train tracks, both Coaster and Amtrak Pacific Surfliner routes had to be halted, the agencies said. Coaster riders were being re-routed using bus bridges, which connected commuters to their Coaster stops via North County Transit District (NCTD) and Metropolitan Transit System (MTS) buses. Amtrak train 561 was halted in Solana Beach for an hour-and-a-half before service resumed shortly after 6 a.m., the agency said. SDSO was called to assist the NCTD to pull the vehicle from the tracks. Crews could be seen pounding the train tracks in order to free the red car, then using a tow to hoist it from the tracks.